Men's freestyle 74 kg competition at the 2016 Summer Olympics in Rio de Janeiro, Brazil, took place on August 19 at the Carioca Arena 2 in Barra da Tijuca. 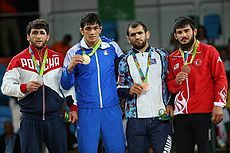 This freestyle wrestling competition consists of a single-elimination tournament, with a repechage used to determine the winner of two bronze medals. The two finalists face off for gold and silver medals. Each wrestler who loses to one of the two finalists moves into the repechage, culminating in a pair of bronze medal matches featuring the semifinal losers each facing the remaining repechage opponent from their half of the bracket. Each bout consists of a single round within a six-minute limit. The wrestler who scores more points in each round is the winner of that round; the bout ends when one wrestler has won two rounds (and thus the match). ^ "Wrestling: Men's Freestyle 74kg Standings". Rio 2016. Archived from the original on 22 September 2016. Retrieved 25 September 2016. This page was last edited on 23 April 2018, at 10:08 (UTC).